Today begins a new challenge at IO Stamps: Orange and Turquoise! This is such a fun combination to work with. 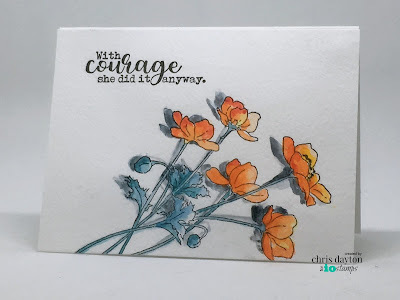 For my card, I chose to use Poppy Bouquet (J8955) and a sentiment from the She Positives set (31878-MD). I stamped the Poppy Bouquet with Versafine ink on Canson Montval watercolor paper. Then painted with Daniel Smith watercolors, adding dark cast shadows from the flowers. The sentiment from She Positives was also added with Versafine ink. Play along and you could with a $25 gift certificate to IO Stamps! You can find the details and link up at the IO Stamps blog by clicking HERE! I love the sideways flowers...they look like they are just picked and laying on a table!!! Lovely! Love the shadows from the flowers. Elegant. Simply stunning!!. I hope one day to be as good as you! !.